A Sheffield civil engineering consultancy has won a top green award for donating 100 per cent of its desks, lights, cabinets and even plants to local schools and charities when it moved office. Arup also says ‘up to 99 per cent’ of waste from its relocation to 3 St Paul’s Place were saved from landfill and building materials were sourced locally. Meanwhile, breakout zones with ‘advanced acoustic engineering’ that stop other employees being disturbed were fitted in the new base, to boost wellbeing. Now, the firm says it is the first in the city to receive a Commercial Sector Office SKA Gold rating. Arup opened its first Sheffield office in 1957. In July, it moved from New Oxford House in Barker’s Pool to 3 St Paul’s Place. It employs more than 130 and occupies the eighth and ninth floors of the building. 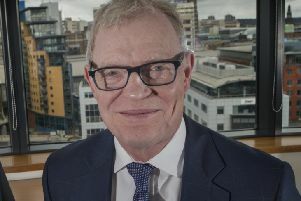 3 St Paul’s Place, a £20m office block, is the sixth and final building in the £200m Heart of the City development which includes the Mercure Hotel, 32-storey tower St Paul’s City Lofts and the Cheesegrater car park. In April, developer David Topham, director of CTP, said that he was working on plans for 4 St Paul’s Place because, “the demand is there”.